TORONTO (Nov. 30) — So, if we were warned — two months ago today — that William Nylander and Mitch Marner would succumb to the usual sophomore difficulty (a combined six goals in 26 games); that Auston Matthews would miss four games and be skating with a sore back; that a pedestrian blue line, at the end of November, would still consist of Morgan Rielly, Ron Hainsey, Jake Gardiner, Nikita Zaitsev, Andreas Borgman and Roman Polak, would any of us have figured the Toronto Maple Leafs to be situated fifth overall in the National Hockey League, three points behind first–place Tampa Bay? Not very likely. Yet, there they are — 16–9–1 for 33 points; with only Tampa, St. Louis, Winnipeg and Columbus superior in the composite standings; only the Lightning with more ROW’s (regulation or overtime wins), 16–15. A marked improvement over the same juncture last season, when the club bolted by 26 points from its 30th–place finish the previous year. 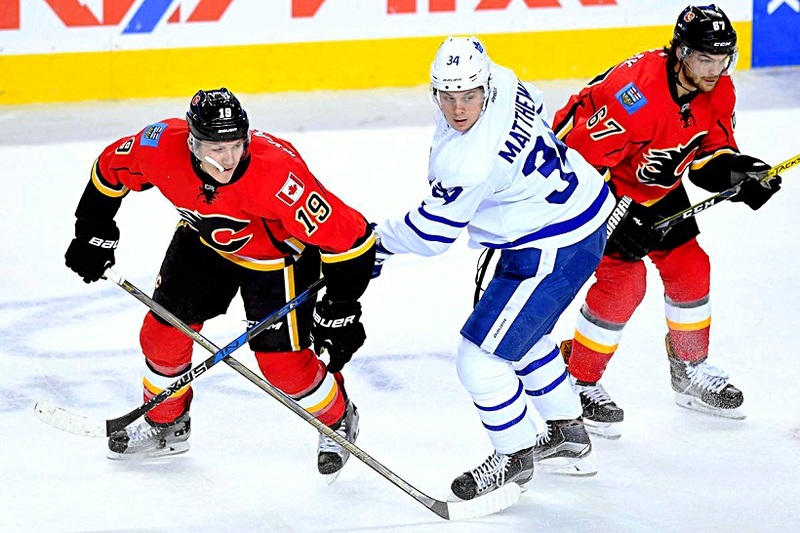 After 26 games a season ago, the Leafs were 11–10–5 for 27 points, six fewer than today. As it reaches the one–third mark of the schedule tonight in Edmonton, the club is on pace to finish 51–28–3 for 105 points — two more than any season in franchise history (the 2003–04 Maple Leafs, under the late Pat Quinn, compiled 103 points). Imagine, therefore, if Nylander and Marner were scoring; if Matthews were completely well, and if the Leafs — as per league–leading Tampa Bay — had an elite, Norris Trophy–caliber defenseman (Victor Hedman). Who knows how far Toronto could be soaring right now? Are the Leafs doing it with smoke and mirrors — perhaps like the expansion Vegas Golden Knights, who stand three positions higher than the defending Stanley Cup–champion Pittsburgh Penguins in three fewer starts? Or, maybe ala Winnipeg, tied with Tampa Bay, Nashville and New Jersey for fewest regulation losses in the NHL (6)? The Jets won their final seven games last season and missed the playoffs by two points. As such, Paul Maurice’s crew is 22–6–4 in its past 32 regular–season matches. We all foresaw that, didn’t we? The answer, of course, is no. The Maple Leafs are not using smoke and mirrors. Or, any other illusion. Fifth place in the NHL standings has been achieved, primarily, as a result of three factors: a) the Vezina Trophy–caliber goaltending of Frederik Andersen after another substandard October; b) the diligent forward–line juggling of coach Mike Babcock, who refuses to reward star players (Nylander, Marner) with ice time if they aren’t producing, and c) the continued excellence of now–veteran center Nazem Kadri, among the most under–rated forwards in the entire league. Kadri, not Matthews, has been the Maple Leafs’ most valuable skater so far this season — putting up 22 points with his enviable mix of soft hands and rambunctiousness. All of this bodes very well for the Blue and White — particularly if Nylander and Marner break out of their second–year slumps. And, of course, if the club continues to remain historically intact (injuries were no factor a year ago, and the Leafs won all four games without Matthews earlier this month). Babcock has improved even more as a coach this season; mixing up his forward units with a deft touch while continuing to plug along without a No. 1 defenseman. Andersen is providing the club its best work between the pipes since the Curtis Joseph–to–Ed Belfour hand–off more than a decade ago. The Leafs, at the one–third pole, are legitimate. With plenty of space to improve. When a couple of long–time media friends, Ken Daniels and Bob Duff, began collaborating on the former’s autobiography last year, neither could have imagined such heartache. Next week (Dec. 7), however, will mark one year since Ken’s son, Jamie Daniels, died in Florida at the age of 23. I’ll never forget my son, Shane, phoning me late at night with the tragic news. I drove to Detroit a few days later to spend some time with Ken and his family. And, I’ve thought about Ken virtually every day since that trek to MoTown. Having grown up in Toronto and worked with me for a decade at The FAN–590, Ken left for Detroit in 1997 and became the TV voice of the Red Wings. Alongside former 50–goal shooter Mickey Redmomd, Ken quickly evolved into one of hockey’s premier play–callers. The Red Wings have won three Stanley Cup titles (1998–2002–2008) during Ken’s time with the club, which easily justified his decision to pen an autobiography (above): IF THESE WALLS COULD TALK. 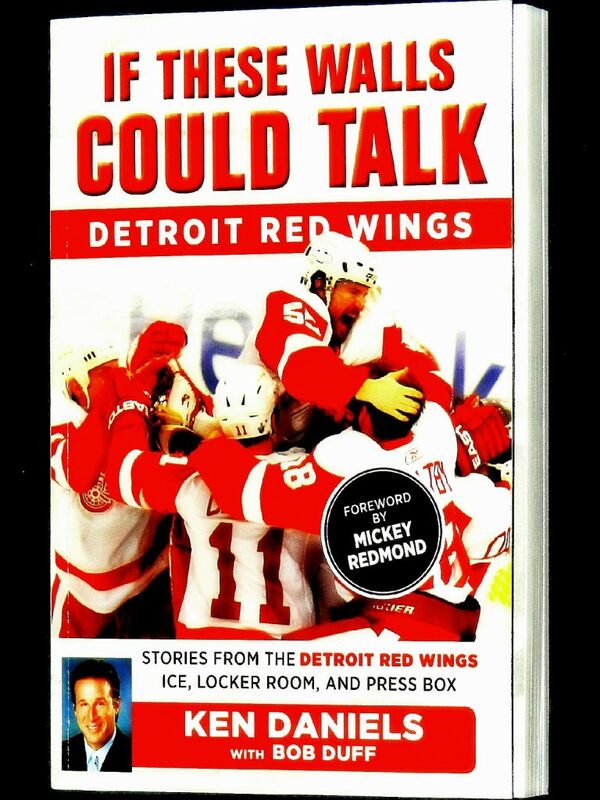 Though the book is billed as “stories from the Detroit Red Wings ice, locker room and press box”, the overwhelming backdrop is one of family, as Ken expresses his grief over, and incredible pride for, his late son. But, he doesn’t stop there. Arlyn Daniels, Kenny’s daughter, is frequently mentioned and there’s a beautiful passage recalling the day, in 2008, that Ken brought his then–93–year–old father, Marvin, to the Air Canada Centre for a game between the Red Wings and Maple Leafs. Marvin Daniels had never before seen his son call a game in person. He died three years later and the memory of those few hours at the ACC will forever remain a life highlight for my old media pal. THE MOVING DEDICATION IN KEN DANIELS’ AUTOBIOGRAPHY. As such, this is infinitely more than another hockey book. Yes, Ken goes into remarkable detail about his time spent amid the most prominent names in the NHL — Scotty Bowman, Steve Yzerman, Nicklas Lidstrom, Mike Babcock to name a few. 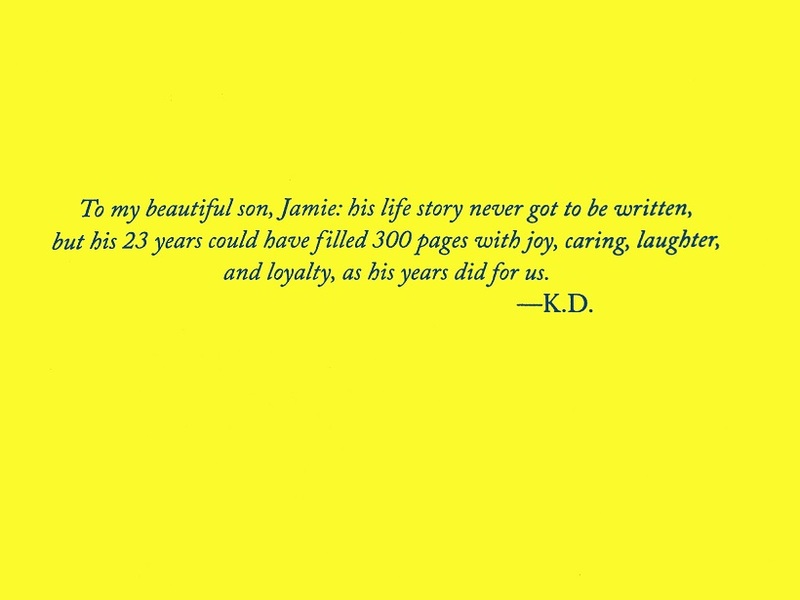 Always, however, at least to this reader, is the specter of Jamie Daniels… and of how Kenny’s wonderful career has been secondary to the people he most cherishes. How one continues in life after losing a child is incomprehensible to me. But, through heartache that will never diminish, Ken soldiers on as one of hockey’s best voices — enjoying the perks of the NHL’s newest facility: Little Caesars Arena in downtown Detroit. I’m proud to know him, and to call him my friend. 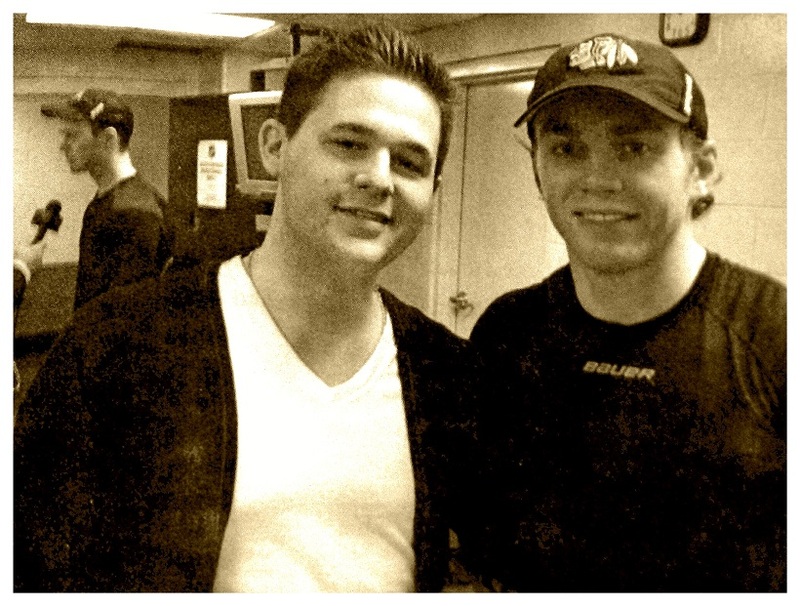 PERHAPS JAMIE DANIELS’ FAVORITE PHOTO: WITH HOCKEY HERO PATRICK KANE (RIGHT) OF THE CHICAGO BLACKHAWKS, AT JOE LOUIS ARENA, ON MAR. 2, 2016. SNAPPED BY HIS DAD. 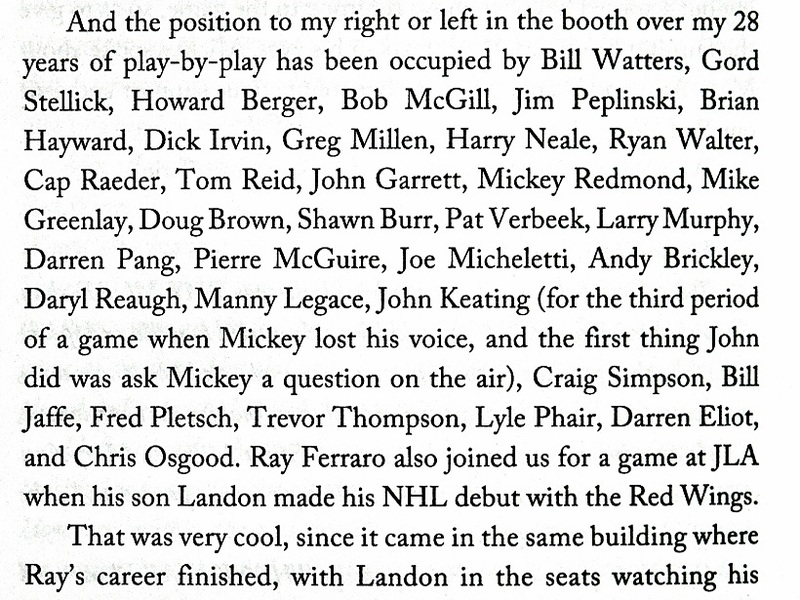 EVEN YOURS TRULY HAS THE PRIVILEGE OF BEING MENTIONED IN KEN’S BOOK — AND AMID SOME RATHER ELITE COMPANY (ABOVE). YES, KENNY AND I CALLED A LEAFS–BLUES GAME FROM ST. LOUIS ON APR. 22, 1995. IT WAS MY FIRST YEAR TRAVELING WITH THE LEAFS AS A REPORTER FOR THE FAN–590. AND, THE FIRST YEAR OF THE KIEL (NOW SCOTTRADE) CENTER. KEN CALLED THE PLAY WITH JOE BOWEN WORKING TV. I SUBBED FOR ANALYST BILL WATTERS, WHO COULDN’T MAKE THE TRIP.